Jacobsen is providing tournament support to the greenkeeping team at Le Golf National on the outskirts of Paris, during the HNA Open de France tournament being held between 29th June – 2nd July. Technical staff from Ransomes Jacobsen in Ipswich will assist staff based at Ransomes Jacobsen France (RJF) in Toulouse throughout the competition. In 2016, Le Golf National signed a preferred supplier agreement with Jacobsen for the next five years following a tender late in 2015. The prestigious golf course, which belongs to the French Federation of Golf and will host the Ryder Cup 2018, has demonstrated its confidence in Ransomes Jacobsen France, who has supplied equipment since 2010. One of the main contractual commitments made by Ransomes Jacobsen and its French branch concerns the preparation and support for the HNA Open de France tournament. This obligation will take the form of regular technical training for the Golf National staff to ensure the correct use and maintenance procedures for the entire fleet in accordance with the manufacturer’s specifications. 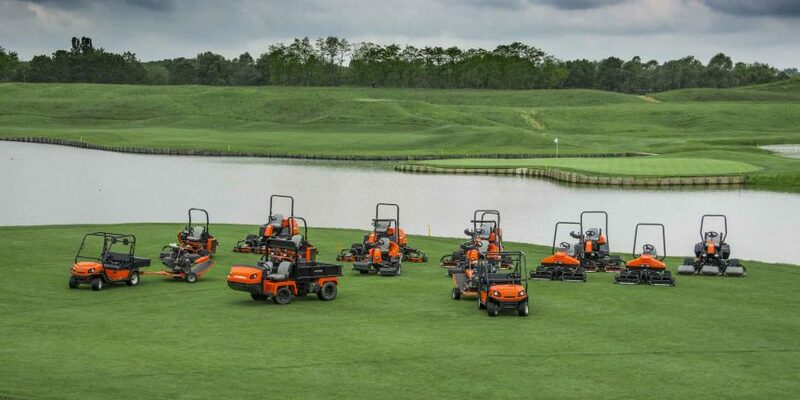 As well as operating a full fleet of Jacobsen equipment, a further 13 machines and 14 utility vehicles have been delivered as part of the tournament support. The additional machinery includes four SLF 1880 fairway mowers, eight Eclipse greens mowers, 12 Cushman Haulers, and two Jacobsen Truckster XD vehicles. “Ransomes Jacobsen France has always provided us with exceptional service, and it will go above and beyond to not only meet, but surpass our expectations. It is important to me that the technical support offered by any partner company is first class, and this is one of the many reasons that we have signed two preferred supplier agreements with RJF since 2010. In the run-up to the HNA Open de France, the products have been tested in tournament conditions and 24-hour technical support will be provided by representatives from both Ransomes Jacobsen in England and France during the entirety of the tournament. Having opened in 1990, Le Golf National has hosted the Open de France 24 times since 1991. It consists of three courses: the Albatros – 18-hole championship course, which the Open de France will be played on; the Eagle – a second 18-hole course and the Oiselet – a 9 hole course mainly used for training.